You guys may remember me reviewing The Ghost of Graylock by Dan Poblocki last year – you guys might not know that after finishing it I pretty much bought every title written by Dan and fangirled at him at the Children’s Author Carnival in May this year. To be frank, Dan Poblocki is fantastic. He is an impeccable writer, and an all around nice guy. Therefore, when I asked him to join us for Fortnight of Fright I had high hopes, and basically squealed in delight when he agreed. Read on to hear about some of Dan’s inspirations for The Book of Bad Things – which I will be reviewing during Fornight of Fright, and let us all simultaneously pray to the horror gods that he decides to write us some creepy adult novels very soon! I once heard film-director Guillermo Del Toro say in an interview that there are three horror-story tropes that are continuously retold: stories in which our homes are being attacked, stories in which our bodies are being invaded, and stories about bad places. When I think of horror classics, they pretty much all fit. Some work in more than one category. Dracula is a perfect example – the castle in Transylvania is a bad place, and later, the vampire invades characters’ homes and infect their bodies. More typically, certain subsets within the horror genre fill the tropes in more specific ways. Slasher or serial killer tales are about home invasion. Alien, zombie, and monster myths often explore body horror. Finally, haunted house and ghost stories are perfect examples of bad places. When I consider my own work, I find that of these ideas, the one I’ve explored the most is this last one. What exactly is a bad place? I believe it can be anywhere that fills you with an unexplainable feeling of dread. A house, an apartment, a hotel, a forest trail, a field, a park, a room, a closet! It doesn’t even necessarily have to be a typically scary spot; maybe it’s a landscape drenched in sunshine or a room filled with toys. The thing about the archetypal bad place is that it leaves you with a feeling that you’re trespassing, that something doesn’t want you there, or maybe it does want you there but for a terrible reason. My books are filled with bad places. In The Stone Child, a haunted clearing in the woods behind an author’s house contains a bone-white, ominous statue of a young girl holding a book. The Nightmarys finds the main characters fighting for their lives in a subterranean cavern below a lighthouse that was build for a nefarious purpose. The plot of The Ghost of Graylock centers around an abandoned psychiatric hospital where several children died under mysterious circumstances. To reveal what the bad place is in The Haunting of Gabriel Ashe would give away a major secret, so I won’t tell you here what it is. In my latest novel, The Book of Bad Things, the young protagonists, Cassidy, Ping, and Joey, learn that an eccentric neighbor, Ursula Chambers, was a hoarder (someone who has a mental disorder that makes them believe it is necessary to never throw anything away). When Ursula dies, the town clears out her old house. Several of her neighbors take home several of her old treasures. Cassidy, Ping, and Joey hear stories that Ursula’s ghost has returned and is threatening people, telling them to return what they took from her or else, and the kids decide to investigate these mysterious rumors. When they explore the dead woman’s house, they discover horrors beyond their imagination and learn how very bad a bad place can be. All of my stories have been inspired in some way by my life, by things I’ve seen or which I’ve long been fascinated. The Book of Bad Things came from a personal experience with what a bad place. About 10 years ago, I moved to a one-bedroom apartment in Astoria, Queens. It was the first time I’d gotten a place by myself, and I took special care to make it as comfy and cozy as possible. I put up curtains and artwork, filled my shelves with beloved books and plants. But very early on, I realized that I was having a difficult time settling in. At first, I chalked it up to living alone, far from any of my friends. After a few months, I realized that wasn’t quite it. Something about the apartment was strange. I couldn’t put my finger on what it was. Before I’d moved in, the landlord had scrubbed it clean. The apartment was in impeccable shape, so why did it make me feel so weird? When I tell people this next part, I expect to receive an Oh! So you’re kind of crazy look. Because the next part is where I tell you that I started seeing things in the apartment, things that shouldn’t have been there. It’s okay. You can give me that look. I am kind of crazy. It started with flashing lights. Tiny bursts and streamers of gold and silver that would flicker and shimmer and die within seconds. At first, I dismissed these visions and tried to ignore them. But then came these black patches hovering near the ceiling or floating by the floor. Whenever I’d try to focus on them, they’d disappear. As the visual anomalies came more frequently, I began to worry that something might be wrong with me – like actually wrong with my brain. The troubles culminated when I began to see someone watching me from my bedroom doorway – a grayish shape that reminded me of a hunched man in a long hooded cloak. He’d stare at me for a moment before vanishing. I’d jump up from my bed and turn on all the lights before searching the apartment, finding nothing. This happened over and over, eventually becoming so commonplace that it almost stopped bothering me. Almost. I went to a neurologist. He ordered a brain MRI which confirmed I had nothing physically wrong with my gray-matter. But he did suggest that what was causing these strange sights might be migraines. Did you know you can have migraines without getting headaches? Neither did I! I learned that people who suffer from migraines often have visual hallucinations, called auras, that precede any physical symptoms. Were the light bursts, the dark patches, and my cloaked visitor the result of these auras? I wasn’t so sure. I’d only started to experience these particular visions after moving into that particular apartment. Plus, I really only saw the visions while at home, nowhere else. The diagnosis seemed like a strange answer, but I had to consider if it was stranger than the alternative. I decided to move on and tried to ignore the auras whenever they popped up. One day, the handle of the toilet broke. My landlord sent over her brother to fix it. As he worked, we chatted, and he started telling me stories about previous tenants. I was shocked to learn that a man who’d lived in my apartment years before me had been a hoarder. This tenant had been seriously ill with what I assume was obsessive compulsive disorder. He wouldn’t ever let the landlord into the apartment despite the neighbors’ complaints of a horrible smell coming from inside. Eventually, the tenant took off, leaving behind everything he’d collected. When the landlord and his family entered the apartment, they discovered what looked like a biohazard area. There was garbage everywhere, including the bathtub, where the tenant had placed a plastic box on which to stand whenever he showered. The worst part was that the tenant’s disorder had kept him from ridding the apartment even of his own waste. Yes. That kind of waste. He’d kept it in jars in his bedroom. When a crew came in to clean out the apartment, they had to do it a bit at a time, taking turns running out to the street, gagging. Of course, after my toilet was fixed, I spent the the afternoon thinking of the hoarder who’d lived in my room. I couldn’t picture my clean little apartment in such a condition. The amount of work it had taken to get it ready for another tenant must have been staggering. I’m pretty sure that the seed for The Book of Bad Things was planted that afternoon. I remember wondering if bad energy could be left over after someone moved out of a place. It seemed like a possibility. Then I considered a flip-side to the story: what if the bad energy had been there first, somehow attached to the land or the building? What if that energy had acted on the poor man, making him behave the way he did? What if my own bizarre experiences in the apartment were somehow related? What if I was living in a bad place? Was it such a huge leap to make that a sufferer of migraine auras could develop a full-blown psychiatric disorder simply because of where he lived? The answer is probably, yes – that is a huge leap to make. But that’s why I’m an author. I make those leaps into the realms of impossibility, and then I turn them into stories. In the end, I left that apartment after 18 months for reasons I don’t even remember anymore. Maybe the apartment was a bad place, or maybe it was all in my head. Either way, it couldn’t have been too horrible – at least I got a book out of it. Bio (From Dan’s website): Dan Poblocki was born in Rhode Island and currently lives and works in Brooklyn, NY. He is the author of The Stone Child, The Nightmarys, The Ghost of Graylock, and The Mysterious Four series. The Book of Bad Things is forthcoming: Aug 28, 2014. Dan loves reading and writing, playing video games, eating cupcakes, snuggling with his cats – Pedro and Tavi – and telling ghost stories late at night to anyone who’ll listen. Dan hates doing laundry, cleaning his apartment, riding on crowded subway trains, and people who honk car horns excessively. Follow him on Twitter. Well, there you go. For those of you who ask where a writer’s inspiration comes from, now you have an answer! For those of you wondering if bad energy is left over, causing certain unexplained experiences, or if bad energy causes things to happen and people to act a certain way- I guess you can deduce that one on your own. 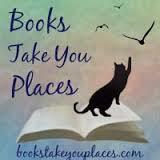 SO MANY THANKS to Dan Poblocki for agreeing to guest post on the blog, I feel so elated! 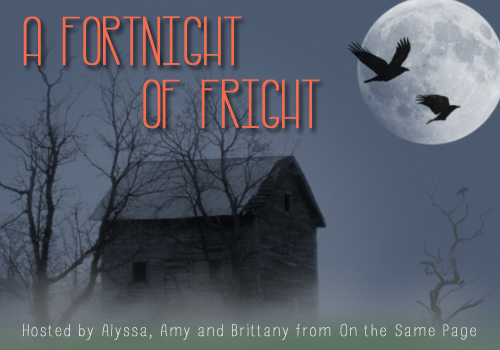 Readers, check out Brittany and Amy’s blogs today! This entry was posted in Event and tagged Dan Poblocki, Fortnight of Fright, ghosts, guest post, horror, paranormal, young adult. Bookmark the permalink.